Banana bread is the ultimate comfort bake. When you’re feeling a little quiet, or the sky has ebbed to grey, baking is always a great solace - but there’s something special about baking banana bread. Perhaps it is the homely, enticing smell of the bananas caramelising in the oven, the freedom of haphazardly adding nuts, fruits or whatever is to hand in what has always been a fail safe cake, or perhaps its evocation of childhood baking, with memories of sticky little hands, flour strewn worktops and banana batter clad aprons. Either way, banana bread always makes the day a touch brighter. 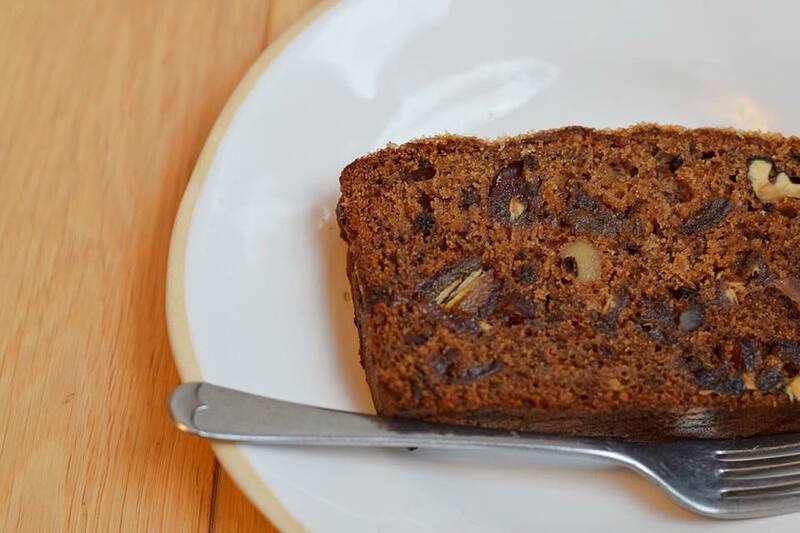 What’s more, banana bread is typically a way of using up excess and overly ripe bananas, so there’s the virtue in having prevented food waste to consider, as well as the mischievousness in having transformed fruit to cake! So often, simple is best. My banana bread is largely faithful to such simplicity, but with a few flavourful tweaks. Firstly, my banana bread is somewhat unusual in its use of butter, as most are oil based. Controversial perhaps, but I find the richness of the butter adds an additional layer of indulgence, and moreover lends itself to a soft, velvety textured cake. I use dark brown muscovado sugar for a deep hit of treacle, which prevents the cake being overly sweet and further compliments the creamy undertones of the sponge (think buttery caramelised bananas!) I add a chai spice blend in with the dry ingredients, which includes cinnamon, cardamon, ginger & black pepper, to give the banana bread a little warmth and lift. The subtle spicing also works in perfect harmony with the toasted walnuts and alluringly sweet dates folded through the sponge just before baking, which contribute not only to achieving heavenly contrasting textures, but layers of robust, decadent flavour. For a final flourish, I top my banana bread with crunchy Demerara sugar, infused with earthy organic vanilla. Much as the sugary crust of a sea side doughnut does, the Demerara unapologetically overloads your first mouthful of cake, melting into the mellow sponge below in all its sticky date & caramel banana glory. Perfect warmed, or cold, immediately or even five days after baking, this cake really is a treasure. Add in the eggs and vanilla paste and set aside. In a new bowl, whisk together the flour, almonds, chai, baking powder, bicarb and sea salt, omitting any lumps. Set aside. In a bowl of a kitchen mixer fitted with the paddle attachment, or in a large bowl with an electric whisk, beat the butter until pale and creamy. Slowly add in the muscovado sugar and beat until velvety. Slowly add the banana mixture and beat slowly until combined.Scrape down the side of the bowl and make sure all the mixture is incorporated. Gently fold in the flour, again ensuring all the mixture is combined, then fold through the walnuts and dates until evenly distributed. Pour into a lined 2lb (900g) loaf tin and sprinkle with the Demerara-vanilla sugar mixture. Bake at 160c for approximately 1 hour 15 minutes - 1 hour 30 minutes until well rise and golden. Let the cake cool before slicing.